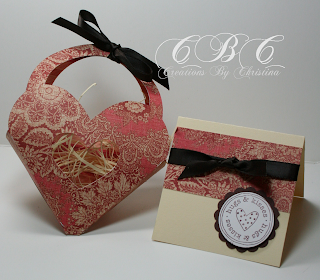 Here's a video on how to make the Heart Gift Bag from Tags, Bags, Boxes and more. I used the window feature on the cricut. I really like how this came out. Hope you enjoy. WOW!!!! That turned out soooooo pretty. I am loving the paper (I think that I might have that same paper) Thanks for the great video. So cute! I loved the matching card. I will have to add that stamp set to my wish list. What a great project, and a super blog too.